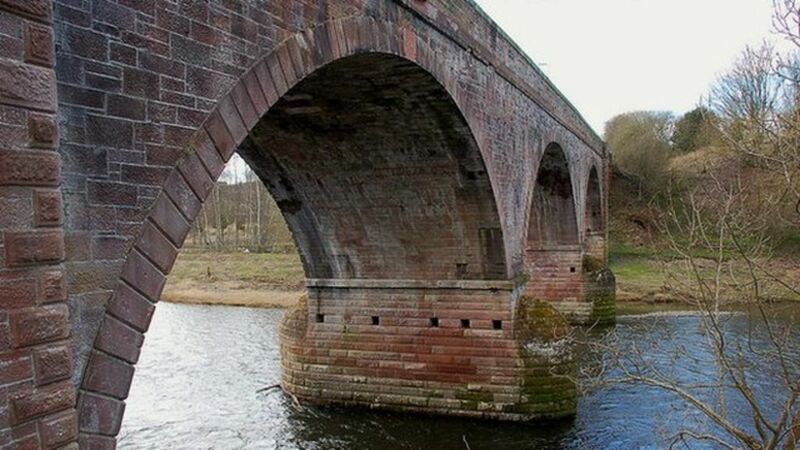 Scottish Borders Council has said its long-term goal remains to see the full restoration of rail services through the Borders from Edinburgh to Carlisle. Trains will return between Edinburgh and Tweedbank, near Galashiels, in the Borders next year. The Campaign for Borders Rail (CBR) called on the council to take measures to ensure the line, which closed in 1969, could be extended in future. Scottish Borders Council says its long-term ambition is to see the full restoration of rail services through the Borders from Edinburgh to Carlisle. A View from the Bridge II. Looking south from the bridge over the trackbed of the Waverley route south of the former Hassendean station in April 2010. This is the location from which Robin Barbour's long running 1960s mystery photograph of 60152 was taken some 40+ years earlier [see image 28700]. The grade 2 listed Waverley Viaduct that carried the Border Union Railway over the River Eden at Carlisle (also referred to as Eden Viaduct, Canal Viaduct and Waverley Bridge amongst others) photographed on 3 August 2011.